Buy, Rent or Skip Three O'Clock High? 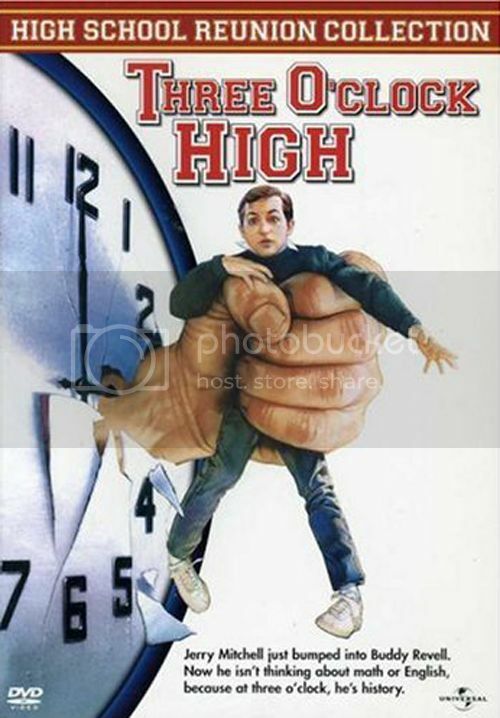 Whenever anyone ask me what movie to check out for references with regards to camera moves (for those aspiring cinematographers), Three O'Clock High is one of two movies I always tell them to check out. There's nothing 'new' about the camera moves in this particular one, but it does have pretty much every single camera move you can think of. I'm talking about some pretty creative camera moves that you don't normally see in most other films. You name it, it's in here. The movie even has some creative transitions as well. I've always been very impressed with the single take steady cam shot that tracks the kids with the first shot on the High School campus. Also impressive was the Library scene with the Shelves-Domino-Effect. I can only imagine how much time went into that setup. If there is one shelf slightly off, they would have to do another take, stacking all those books back in place before shooting. Yikes! So, does this movie offer anything other than a 'Cinematography 101' course? It does. Three O'Clock High is never going to be compared to or put in the same category of any of John Hughes films, but there is enough stuff going on in this one to make it very entertaining. The plot is simple: Jerry Mitchell (Casey Siemaszko) tries to ditch school after being challenged to a fight after school by the school bully, Buddy Revell (Richard Tyson).....at Three O'clock. If there is one fault that the movie has is there is absolutely no character development whatsoever. This movie is more of a comedy than anything else and because of that, I really don't expect characters to reveal much about their past or their ambitions. My Bodyguard, which Three O'Clock High owes a big debt of gratidtude, is still the gold standard by which all High School Bully films are measured. But Three O'Clock High does boast one of the greatest and most satisfying fight scenes ever, second only to My Bodyguard's epic fight. Worth a Rent for sure. Be on the look out for Jeffery Tambor, Philip Baker Hall ,Mitch Pileggi and Yeardly Smith. One thing you need to know about this DVD. The High School Reunion Collection isn't what you think it is. It's not a Special Edition of any kind. It's bare bones. It doesn't even have a frickin' Trailer! Ugh! I bought this when it first came out thinking it would have bonuses. I hate when Studios purposely mislead the consumer like that.